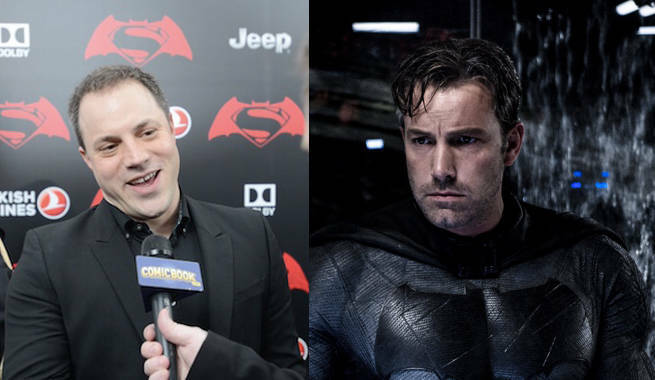 Ben Affleck has said he's working on "something" with Geoff Johns. Kevin Smith said he heard it from Johns, too. Now, Comicbook.com has confirmation from Geoff Johns directly. When Johns sat down with us to talk about DC Universe Rebirth #1, he also talked about just what it is he's been doing as Chief Creative Officer. "My job is to help other Warner Brothers divisions work with DC. I work with Warner TV and producers to get these shows up and running, in particular with The Flash, where I co-created the show, wrote a few episodes, wrote the pilot episode," Johns said. "I work with other people, Ames Kirshen in games, the studios like Rocksteady and Netherrealm, go in there on character choices, story they’re going to do and brainstorm on that, try to keep it true to comics." But when Geoff Johns sits down with family or friends outside of the business, he says, "I just tell them I write comics (laughs)." Now, he's focusing more on his job as CCO, which means he's taking a step back from writing comics for the time being. So his go-to job description for them is out. "I do get to say I'm working on Batman with Ben Affleck," Johns told us with a smile. "That gets the Thanksgiving table excited, especially my brother." While Johns cannot currently comment on his reported move into a "larger hand" in DC comics movies alongside Jon Berg, this is the first open confirmation he has made of his work on an upcoming Batman solo movie with Ben Affleck. Affleck, of course, debuted as a grittier (and most would say, harsher) Batman in Batman v Superman: Dawn of Justice, and was largely praised for his portrayal even by those otherwise critical of the film.